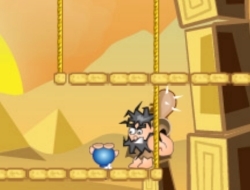 You will play a prehistoric man in this fun adventure game and your goal is to try and find all the hidden items and bonuses but in the meantime you also have to keep an eye out for all the cute but dangerous creatures that are walking the platforms. Jump underneath them and they will flip on their backs. Touch them or jump again underneath them to knock them out and send them flying down. Use the special items you get and see what they do against the enemies. Destroy a certain amount of monsters and you will advance to further and much tougher levels that will test your skills. Use the arrow keys to move and jump, Space to use a special item. Prehistoric 0.00 between 0 and 10 based on 0 votes.